Consider this. As of the middle of 2011, German banks had loaned out about 170 percent of their total equity capital to governments in Greece, Ireland, Portugal and Spain. French banks had about a 100 percent capital exposure to the same governments. The number shoots significantly higher when Italy is added to the equation. U.S. banks meanwhile, hold about $700 billion of government debt from the five shakiest Eurozone economies. We are, in short, very close to seeing “World Financial Crisis: The Sequel,” a disaster with enormous implications. Yet, where is the investigative reporting about the underlying causes of this? Where are the stories explaining how it is that three years after the collapse of Lehman Brothers investment bank triggered an acute financial meltdown in 2008, so little has changed? Worse, just as they did in 2008-9, governments are rushing to rescue rickety banks with public funds. That’s why the European Central Bank, the IMF and Europe’s leading powers keep bailing out ailing states like Greece, Ireland and Portugal. Again: follow the money. When debt-strapped governments receive hundreds of billions in new loans, that money is immediately sent into the coffers of private banks as payments on past loans. The whole situation, observes one writer in the Financial Times, “resembles a pyramid or Ponzi scheme” in which original lenders are paid back with new loans. The difference is that the new loans are coming from public funds, which is another way of saying that private banks are being rescued once more by the people. Just as in the global bank crisis of 2008-9, bank profits are private, but their losses are public. Not exactly the free market. But it’s a nice deal for profligate bankers. And the scale of this cozy deal is breathtaking. In July, the U.S. Government Accountability Office published a document detailing the the bank bailouts. Between December 2007 and July 2010, it shows, more than $16 trillion was channelled by the American government into U.S. and European banks. Trillions more were spent to bail out U.S.-based auto corporations and to fund stimulus programs. Additional trillions were dished out in bank rescues and stimulus programs in China, Latin America, Europe, and beyond. At the time I released Global Slump (December 2010), my estimate for the combined global bank bailout and stimulus spending was in the range of $21 trillion, or more than one and one-half times U.S. gross domestic product. It is now clear that my estimate, among the largest (and arguably most accurate) at the time, was many trillions shy of the real total. That astounding bailout of global capital drove a massive build-up of government debt. Engaged in a world-wide intervention without precedent, states borrowed in debt markets (by selling government bonds). Now, in light of the scale of the accumulated debt, some lenders have grown gun shy. They doubt the capacity of many governments to repay. As a consequence, lending rates have soared: Italy and Spain can only borrow (for ten year bonds) at rates in excess of five percent. For Ireland, the rate is pushing toward nine percent; for Portugal it already exceeds 11 per cent; and for Greece it has hit a nightmarish 23 per cent. And when it comes to short-term borrowing, Greece has already been shut out of money markets, which are demanding an interest rate of 80 percent on its two-year bonds. In sum, Greece is broke and a default is almost certainly just a matter of time. Extortionate borrowing rates on this scale mean that the debt crises just get worse. Barring a miracle – or our preferred option, default – each of these countries will be more indebted next year, and the year after that, notwithstanding slash-and-burn austerity programs. Meanwhile, those programs, with their massive cuts to government spending and huge public sector layoffs, invariably deepen the economic crisis. 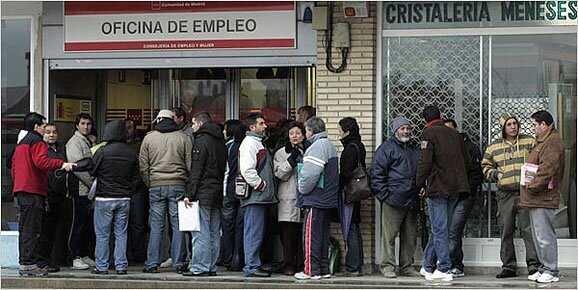 Already, the official unemployment rate in Ireland has catapulted above 14 percent (27 percent for youth), while in Spain it tops 21 percent (45 percent for youth). Greece, meanwhile, is in a full-fledged depression, its economy contracting by 5.5 percent this year with no sign of recovery for years to come. Of course, there has been massive resistance: general strikes, youth occupations of city squares in Greece and Spain, popular uprisings in Tunisia, Egypt and beyond, a student-led upheaval in Chile. But in much of the world, the degree of public anger has been surprisingly low – at least thus far. And part of the responsibility for that lies with a media culture that blames the victims and refuses to follow the money. We need the same critical sensibilities when it comes to the debt crises that are rocking parts of Europe at the moment. In the face of the banal mainstream discourse of undisciplined borrowers, we need to demonstrate that, as one senior economic advisor at UBS bank puts it, we are dealing with “a once-in-a-generation crisis of capitalism.” That crisis has ratcheted up the system’s crimes against the innocent. And there is a powerful way to expose that: Follow the money. Always follow the money. David McNally teaches political science at York University, Toronto and blogs at www.davidmcnally.org. His recent book on the world economy is Global Slump: The Economics and Politics of Crisis and Resistance. See the charts assembled by Martin Wolf, “The Eurozone after Strauss-Kahn,” Financial Times, May 17, 2011. Mario Blejer, “Europe is Running a Giant Ponzi Scheme,” Financial Times, May 5, 2011. United States Government Accountability Office, Federal Reserve System: Opportunities Exist to Strengthen Policies and Processes for Managing Emergency Assistance, (July 2011)., Table 8, p. 131. Important analysis of this report is provided by Petrino Dileo, “The $16 Trillion Bailout,” socialistworker.org, September 7, 2011. David McNally, Global Slump: The Economics and Politics of Crisis and Resistance (Oakland: PM Press, 2011), pp. 2-3, 197n4. See my previous blogs, “Night in Tunisia: Riots, Strikes and a Spreading Insurgency,” January 18, 2011, available at: http://davidmcnally.org/?cat=6; and “Mubarak’s Folly: The Rising of Egypt’s Workers,” February 11, 2011, available at: http://davidmcnally.org/?p=354. On the student protests in Chile, see Manuel Larrabure and Carlos Torchia, “’Our future is not for sale’: The Chilean Student Movement Against Neoliberalism,” The Bullet, n. 542, September 6, 2011, available at: http://www.socialistproject.ca/bullet/542.php. George Magnus, “Markets are Reacting to Crisis of Capitalism,” Financial Times, September 12, 2011.